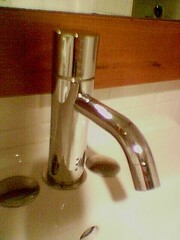 This is the faucet in the restroom at West Elm, the modern furniture spin-off of Pottery Barn. I was unable to get water to come out for 3 minutes. The top spins allowing control over hot/cold settings, but neither pushing nor pulling it would start the water. I tried yanking on the spout, but nothing happened. So I twisted the whole thing and it started making a scraping noise and coming apart. Yikes. But as I was doing this, I inadvertently covered up the little holes in the base – motion sensors. Water poured all over my arm.